Rabbits can get tumors just like many other kinds of animals. Sometimes they can be a problem and other times they are simply unsightly. But it is important to know what kind of tumor your rabbit has or doesn't have so that you can take all the necessary steps to keep your rabbit safe and healthy. Rabbits don't typically get this type of tumor that is composed of fatty tissue. Lipomas can be found all over the body and are usually softer or more "squishy" than other types of tumors. They are non-cancerous but can grow very quickly. The primary concern with lipomas is if they get so large that they cause mobility issues in your pet rabbit. If your rabbit gets a lipoma, discuss removal with your exotics vet. Cysts are pockets in the skin that are filled with a cystic material (similar to a zit in people). These can form all over the body and are usually more firm than a lipoma. Sometimes your exotics vet may even be able to lance the cyst and express the material without sedating your rabbit. Other times they must be surgically removed under general anesthesia. Cysts are not typically an issue unless they rupture and become messy and infected. When a cyst ruptures it is also painful for your rabbit. There is no medication that can be given to make a cyst go away but antibiotics will be prescribed if your exotics vet is concerned about an infection. Internal cysts, such as ovarian cysts are not seen but may be able to be palpated or identified on a radiograph (x-ray). If your rabbit is not spayed she may be at risk for developing ovarian cysts. An abscess is a pocket of pus. Pus is made up of bacteria and white blood cells and denotes an infection in that area. Abscesses can look like a tumor or lump that is growing but when it is lanced (popped) the purulent discharge oozes out of it. They are not tumors. If you notice a foul smell and pinkish fluid oozing from somewhere on your rabbit he may have a ruptured abscess. Abscesses form from trauma and infection or just infection. They can occur anywhere on the body and should be treated immediately. A wound, diseased or overgrown tooth and other causes of infection can all result in abscesses. These are the most concerning type of tumors. They can occur anywhere in or on the body but aren't always malignant (cancer that spreads). Sometimes benign tumors can be entirely removed and no more concern about that tumor needs to happen. Cancerous growths can present in multiple different ways but often times they are fast growing and firm lumps. Rabbits can get the same kinds of cancerous growths as dogs and cats such as osteosarcomas. These nodules occur in some rabbits that have certain strains of chronic myxomatosis. A vaccine for this awful disease that is typically transmitted through insect bites is available in the U.K. but not the U.S. 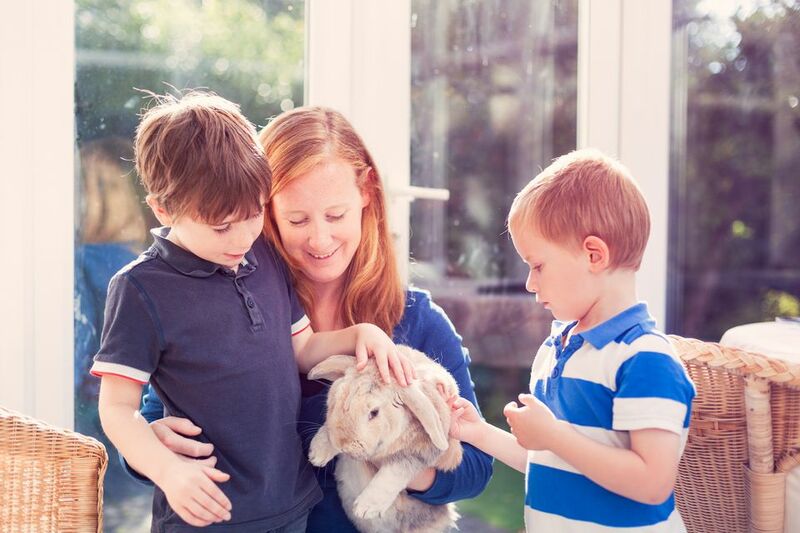 If you feel a lump on your rabbit, whether or not it is oozing, firm, soft, or pendulous, you should have it checked out by your exotics vet as soon as possible. If the growth needs to be surgically removed and there is a chance it is cancerous it needs to be taken care of sooner rather than later in case it is a malignant form. Not all lumps are bad, but by being proactive and getting each lump checked out you can hopefully lengthen your rabbit's life and keep him as comfortable as possible.